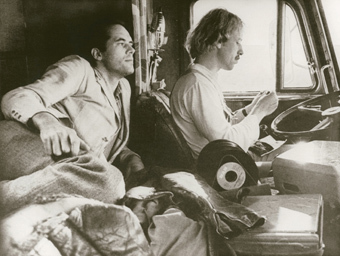 In the Course of Time focuses on the relationship that develops between two men - movie projector repairman Bruno and suicidal Robert - as they travel in a truck on the dusty roads along the border between East and West Germany. Lonely and introspective, they both long for the company of women. By the end of their journey, they derive comfort from the fact that "in the course of time" (the literal translation of the film's German title), their lives have taken on some shape and significance. In the Course of Time is a quiet, almost lyrical film that disdains psychological motivation, suspense and dramatic tension.